Before I had even visited the magical city of Budapest, I already knew it was going to be a favourite. It has been near the top of my “must travel” list for many, many years. Finally the opportunity came to visit. After my last season finished in Jakarta, Indonesia I jumped on a plane to hang out with Rudy in Innsbruck while he finished up his last few games. When his season was done we had about a week to go off on an adventure. A little crazy, but we decided to drive all the way to Budapest, Hungary from Innsbruck, Austria. Unfortunately Innsbruck is the furthest west city possible so we ended up driving across the entire Austrian countryside into the middle of Hungary. Overall it took about 8 hours with a few necessary coffee stops along the way. Budapest did not disappoint. I already knew I was going to fall in love with the city and fall in love I did. Beautiful cobblestone streets with amazing restaurants, cafes, and hidden little shops around every corner. The history is rich and there isn’t a shortage of things to do, see, and eat in this city. Grand boulevards that rival any Parisian street, a beautiful blend of history, culture, and lively trendy cafes. Around every corner is a treat for the eyes. Tired after a day of exploring? Soak in one of the many famous thermal baths or do a rotation and see which one is your favourite! Keep reading to learn the ‘Must-Sees’ in Budapest; I guarantee that everyone will find a piece of magic here. Whether or not you have a couple of days or a week to explore make sure you bring your walking shoes to get a full taste of the city! If you’re driving in to Hungary you have to stop and buy a “car pass”. If you’re flying you don’t need a visa. The city is split into two distinct sides, Buda and Pest, and connected via many bridges. You can easily get around by foot (we walked everywhere) but Uber is available here and the trams are very efficient. Most shops and restaurants take credit cards but smaller shops appreciate cash. Be sure to have some on hand. Bring your swimsuit! The thermal baths are a MUST. Callas House was one of those "we're spoiling ourselves" accommodations except that the bill did not mirror that. You can find a lot of great places to stay in Budapest for a very reasonable price; places you would find in other central European cities going for upwards of 400 euros a night. It was located right next to the State Oprah House which made for a magical view.. The hotel building itself was made in 1881 so it had a very elegant and rustic theme. Right up my ally! A viewpoint from Fisherman’s Bastion on the Buda bank of the Danube. Over the bridge is the Pest side of the city. Matthias Church at the heart of the Buda's Castle District; built in the second half of the 14th century. Szechenyi Chain Bridge: one of the most iconic and picturesque landmarks of Budapest. We only had two full days here so we set off on foot one morning after a lovely breakfast to essentially see all the sights in one full day (I admit I am hard to keep up with on quick trips!). Because our hotel was in such a great location we ended up doing a round about walking tour without really even planning the route prior. We walked East up the mains street which took us in and around Varosliget Park and Vajdahunyad Castle (build in 1896). The Szechenyi Baths are also located within this area which we ended up going to the following day. Over the bridge to Heroes Square: one of the major squares in Budapest noted for the iconic statue complex featuring the Seven Chieftains of the Magyars and other important national leaders, as well as the tomb of the unknown soldier. It also hosts the Museum of Fine Arts and the Mucsarnok. Heroes Square: At the base of the columns are the Seven Chieftains of the Magyars or clans.These clans eventually established the Principality of Hungary. House of Parliament: is the seat of the National Assembly of Hungary and one of Europe's oldest legislative buildings. It lies in Lajos Kossuth Square on the bank of the Danube. If you're walking over the Chain Bridge at night you can turn North and see Parliament lit up along the river. Make sure to wander around the square and take in your surroundings. I was fascinated by the little yellow tram that would pass along the other side of Parliament. So cute and it really reminded me that I was in Budapest! You're also surrounded by the Ministry of Agriculture and a few other notable museums - the architecture in this area was beautiful. 1956 Memoriam: underground on the outskirts of Parliament Square we stumbled on this memorial showcasing some of the horrific events of the war. It's so wild to think of a time not so long ago when these terrible acts were taking place in the same areas I had just been walking on. It was super grounding to be reminded of Budapest's hard history as we continued our trip. Shoes on the Danube Bank: a memorial to honour the people (mainly Budapest Jews) who were killed by fascist Arrow Cross militiamen during World War II. They were ordered to take off their shoes and stand near the edge of the river where they were shot so their bodies fell into the river and were carried away. A horrific scene, but there were a lot of people at the edge of the river paying their respects to these lost souls. Szechenyi Chain Bridge is a notable landmark in itself spanning the river between Buda and Pest (the western and eastern sides of Budapest). It was the first permanent bridge across the Danube River and was opened in 1849. I suggest coming back here at sunset to get a fantastic view of both Buda and Pest and if you're lucky you might be one of the only tourists on the bridge! Shoes on the Danube River Bank: one of the most moving memorials that can be found openly in the city. These shoes cover a stretch of the river bank. Szechenyi Chain Bridge: connecting both the Pest and the Buda side of the city. Walk through the Castle Garden up to Buda Castle: which is the historical castle and palace complex of the Hungarian kings of Budapest and was first completed in 1265. In the past it has been called Royal Palace and Royal Castle now bounded on the north by what is known as the Castle District, known for the medieval 19th-century houses, churches, and pubic buildings. There was a movie scene being played out on the edge of the castle (some fight scene and taxi car race) that we got to spy on for a bit! Another little walk to Matthias Church which was one of my favourite sites in the city! It's right in front of the Fisherman's Bastion at the heart of Buda's Castle District made in a Gothic style in the second half of the 14th century (top left and top right of the photos below). It started raining while we were inside touring the church but once it stopped, we went out to walk around and explore the views of the Bastion. A superb view of Pest, Fisherman’s Bastion is a terrace in neo-Gothic and Romanesque style situated on the Buda bank of the Danube on Castle Hill. It was designed and built between 1895 and 1902. It is located right beside Matthias Church, free of charge to wander around, and boasts one of the best viewpoints in the city. Definitely on the Must-See list. Back over the Chain Bridge, we made sure to walk around the extravagant Four Seasons Hotel on route to the main area of Buda. Not a normal site to see in the city, but it is beautiful and reminds me of the Grand Budapest Hotel. The streets behind it are packed with adorable and delicious-looking restaurants with a lot of patios lining the cobblestone streets which eventually all lead to St. Stephen's Basilica. Also unbelievably beautiful, it was luckily just a stones throw away from our wonderful hotel. Our ‘Day - 1 - Blitz - Walking - Tour’ was slightly aggressive and both my husband I woke up feeling extra exhausted. A past Hungarian teammate of mine suggested that we spend an afternoon at one of the Thermal Baths so we slowly made our way there. We woke up and had an amazing breakfast at the restaurant cafe which was attached to our hotel (Callas Restaurant) and then walked to the famous New York Cafe for a fancy hot beverage (top right photo below). One of the best things about exploring new cities is that just walking out of the door is an adventure; getting lost down some winding side streets and stumbling upon the local-gems. It’s one of my favourite things to do. So with my camera at the ready we continued on a no- so-straight path to the thermal baths. There are apparently 1000 natural spring water sources in Hungary and many of the thermal baths in Budapest are a century old. 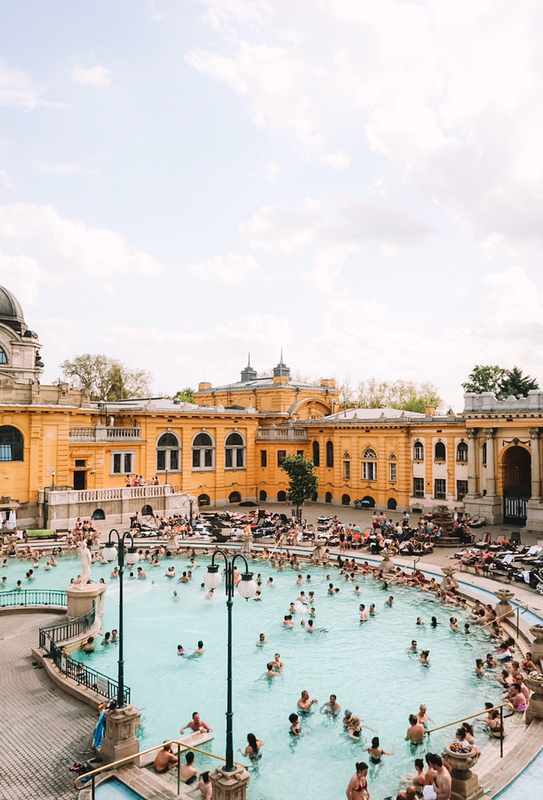 There are a few larger thermal baths you can find in the city but we decided on the Szechenyi Thermal Baths which is the biggest and most popular in Budapest and also one of the biggest natural hot spring spa baths in Europe. This thermal bath turned 100 years old in 2013! There are 18 pools in the Szechenyi Bath and is open every single day of the year so we decided to try it out for ourselves! It was amazing. An absolute Must-Do. If you have more than two days in Budapest I think it would be really awesome to check out a few of the thermal baths. Whether you want a lot of pools, less crowds, to go in the day or in the evening, there will be one for you! Overall, Budapest is a magical city and I will certainly be returning one day. We got a lot checked off our list and walked a lot of miles in the two and a half days we were there. A Must-Visit city with a lot of Must-Sees!